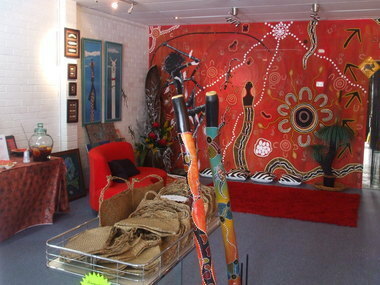 The House of Koorang Gallery is owned and operated by international renowned Aboriginal artist and Eora Elder, Mundara Koorang and his wife Novy. The focus of the gallery is in providing education and opportunities for local Indigenous artists. Mundara said a wall has been set aside specifically to display the artwork of young Indigenous artists from the Shoalhaven. In addition one day a week has been set aside when school children will be invited into the gallery to hear Dreamtime stories and take part in cultural information and discussion sessions. The Koorang Gallery also contains an Indigenous shop that displays jewellery items from tribes of the American Indians, Egyptian and African peoples. Mundara and Novy are currently awaiting approval from a Mauri Elder to be able to showcase some Mauri products. When entering the gallery visitors are greated with the scents of the Australian bush, Rainforest and Wildflower incence and native oils, grown, manufactured and packaged in Australia. A murel that spans the entire back wall painted by Mundara, Novy, Nganuwaay Koolyn and Koo is breathtaking.